Although airbags constitute one of the most effective safety devices for keeping vehicle occupants safe during a motor vehicle accident, this form of vehicle safety equipment poses dangers when it is defective. While defective airbags that fail to deploy, deploy too aggressively, or deploy at the wrong time have historically been a cause of severe injury or wrongful death, a new threat has arisen in the form of exploding airbags manufactured by the Japanese airbag supplier Takata. The Takata airbag recall is the largest vehicle recall in history with estimates predicting that the recall potentially affects 34 million vehicles in the United States. Sacramento defective airbag injury lawyer, Ed Smith is committed to seeking the fullest measure of compensation for vehicle occupants injured by defective airbags. Because I have been representing personal injury victims, including those injured by faulty airbags for over 30 years, my law office can provide the experience, skill, and tenacity you need when taking on the manufacturers of vehicle components and their insurance companies. My reputation for exemplary legal representation, the highest standard of legal ethics, and effective communication through the entirety of our attorney-client relationship is reflected by my many positive reviews on websites across the web including Yelp, AVVO, and Google. The tragic stories involving the exploding airbags manufactured by Takata have been covered extensively by media sources because the recall amounted to the largest automotive recall in history at the time. According to lawsuits filed against Takata, the defective inflator and propellant devices might deploy improperly during a collision. When this occurs, the airbag can explode and propel metal shrapnel at vehicle occupants. The defect has been linked to over ten deaths as of May 10, 2016, and close to 140 fatalities according to autoweek.com. Because the Takata airbag recall is estimated to include over 34 million vehicles in the United States and another seven million worldwide, the number of injuries and fatalities will continue to mount as the recall is slowly implemented. Airbags are designed to augment seat belts in reducing the risk of devastating injuries to vehicle occupants. The National Highway Traffic Safety Administration (NHTSA) estimates that airbags saved the lives of approximately 1,227 vehicle occupant per year over a period of two decades. When seat belts and airbags are used in combination, the probability of surviving a crash increases by over sixty percent. However, a malfunctioning airbag can create a false sense of security for vehicle occupants. The basic design of airbags involves a sensor system that communicates with a control module which triggers inflation of the bags made of nylon fabric. The inflated airbags prevent contact of vehicle occupant heads with the steering column, dashboard, windshield, door frame or other hard surfaces that can cause traumatic brain injuries, spinal injuries, and other serious forms of injury. Airbags are only supposed to deploy during a collision based on sufficient impact, usually when the vehicle is traveling at a speed of at least 15 mph. Deployment When Inappropriate: Because airbags deploy with immense force at high rates of speed, they can cause severe injuries that include broken bones, head injuries, and blindness just to name a few examples. If you are involved in a minor fender bender, airbag deployment can cause serious or even fatal injuries when none would otherwise have occurred. Failure to Deploy: Since airbags provide an effective barrier between the head of vehicle occupants and hard surfaces within a vehicle, occupants can suffer far more serious injuries in a collision when airbags fail to deploy. Overly Aggressive Airbags: When airbags deploy with excessive force, they can cause catastrophic injury or death. Airbags deploy with extreme force, but problems with chemicals and inflators can magnify this force to unsafe levels. Improper Timing of Deployment: Airbags are designed to fully expand prior to vehicle occupants making contact with the fabric of the bag. Late deployment can mean the bag continues to expand into the torso, chest, head, or face of a vehicle occupant, causing fractures, crushed bones, internal organ damage, traumatic brain injuries, and other devastating forms of injury. If the airbag deploys late, the bag will not provide the maximum amount of protection when the head of the vehicle occupant impacts the bag. 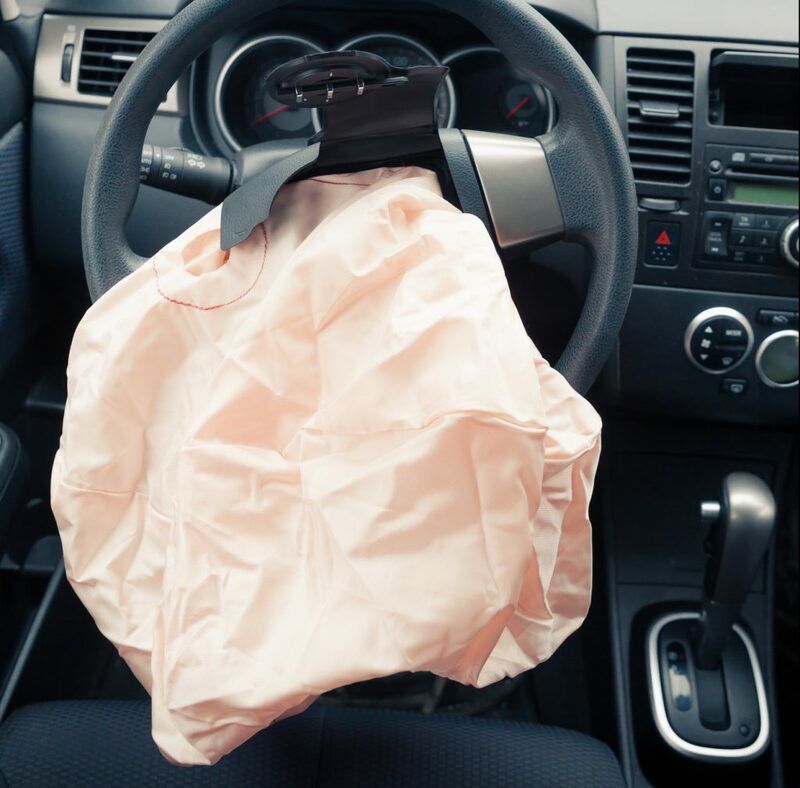 Missing or Counterfeit Airbags: Some used and refurbished vehicles are missing airbags, so vehicle occupants are deprived of protection during a crash. In other cases, counterfeit airbags that are unsafe and not designed according to manufacturer specifications are reinstalled to save money. Improper Airbag Positioning: Airbags are designed to inflate upward, but improper positioning can result in the airbag inflating toward the vehicle occupant. Under-inflation: When an airbag is not designed or installed properly, it might not fully inflate, so vehicle occupants are not fully protected. Over-Inflation: If airbags inflate too fully, they can cause severe trauma as they inflate into the body or head of a vehicle occupant. If you are injured in a crash or suffer more severe injury because of a malfunctioning airbag, you might have a right to pursue a product defect claim against the vehicle and/or airbag manufacturer, designer, or retailer. It is important that you retain an attorney who will work closely with industry experts to identify the cause of an improperly functioning airbag, such as poorly located sensors, defective control modules, defective inflators, and other malfunctioning components. I’m Ed Smith, a Sacramento Personal Injury Lawyer. If you or a family member have been injured in a crash caused by a defective airbag, please call me today at 916.921.6400 for free, friendly advice and to meet my friendly staff. Please take a moment to review a long history of my successful case Verdicts and Settlements.